Given its location and available industrial space, Chicago is well-suited to take advantage of the rebound in U.S. manufacturing. So writes Robert Reed in the Chicago Tribune. Citing a chronic worker shortage in rural 'company towns,' Reed sees employers looking to relocate operations to urban centers like Chicago. "For those coming to Chicago, there's no shortage of available industrial space opportunities," he writes. "Chicago has 26 designated industrial corridors, located in nearly every city corner and containing two-thirds of all the land that's zoned for manufacturing. 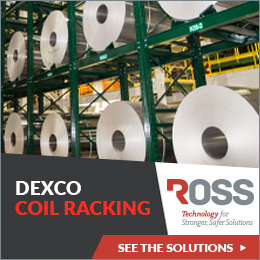 Many of the city neighborhoods where these industrial and light manufacturing sites are available are a couple of miles from expressways, airports, and rail lines—transportation arteries that are essential to getting products to customers." A concerted effort by government and the private sector, underway but in an early stage, is key to bringing manufacturing back to the Windy City, according to Reed. 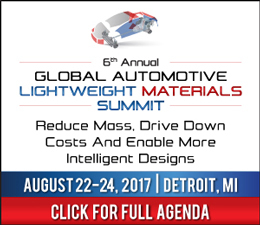 GALM Detroit, The Largest Automotive Lightweight Series Is Back Featuring Ford, Tata Motors, Hyundai, Volvo, GM, FCA & More. Unveiling The Latest Material Strategies Including Aluminium, Steels, Magnesium & More, And New Solutions For Mixed Material Joining, Forming & Welding. Join Us In Detroit In August. 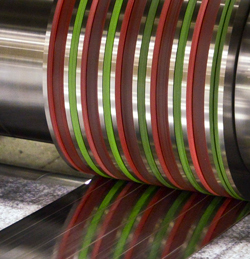 Since 2012, Spanish Tier One auto supplier Gestamp has invested more than $500 million in its U.S. operations, locating near auto OEMs in the autocentric Midwest and Southeast regions. That includes "its new research and development center in Auburn Hills, MI, that will employ 64 engineers and technicians and house robotic prototype assembly cells, a laser welding cell, durability performance lab and metallurgical and metrology labs," states a WardsAuto article summarizing Gestamp and its recent U.S. moves. Evolving from its stamping roots, Gestamp has been active in hot-stamping technology, as chronicled in the April 2017 issue of MetalForming. "Hot stamping gets you to ultra-high-strength steel levels," Paul Belanger, Gestamp's R&D director at the new Auburn Hills center, tells WardsAuto. "We're forming the steel when it's red hot, so it's very malleable at those temperatures. We get very tight radii and good, complex shapes." Once again in 2017, we are looking for women in leadership positions or on the shop floor, those who represent dedication to their company and the industry, and demonstrate excellence in meeting their workplace responsibilities. MetalForming magazine is seeking nominations for its 2nd Annual Women of Excellence in Metalforming and Fabricating section, to run in the November 2017 issue. The section will feature and honor those selected as a means to recognize and promote the importance of women in the metalforming and fabricating industries. Nominees should be employed by a manufacturer of metal parts and components or a supplier to the industry. Winners from 2016 are ineligible, but previous Honorable Mention recipients can be nominated. Fill out the form ASAP as the nomination deadline is July 28. Please nominate only one person from your company. MetalForming magazine will host the 3D Printing for Jigs, Fixtures & Prototypes in Cleveland, OH on September 7. This event will provide attendees with a deep understanding of how 3D printing is being used in metalforming and fabricating operations and techniques to improve your design and production of jigs, fixtures and prototypes. For complete agenda, speakers and registration information, visit the event webpage. 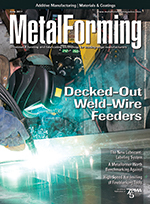 New arc-welding wire feeders place the brains inside the welding system, allowing manufacturers to better manage weld quality, improve consistency, and reduce setup and cycle time. ...and in with new safety datasheets. As of June 1, 2016, OSHA requires use of a new 16-part international communication protocol that provides for a uniform, user-friendly method for identifying chemical hazards and specifying protective measures and safety precautions. Detroit Tool Metal Products Co.